SOLE AGENT! 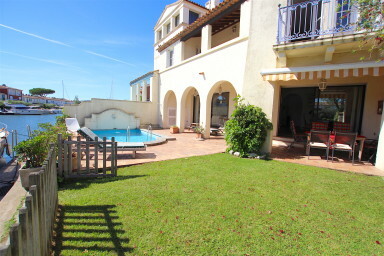 Large house of about 190sqm in a private area close to the center of Port Grimaud and the beach. Come into the house and you will immediately notice the spacious living-room/ dining-room and its sliding windonws opening onto the pool and the canal. On the ground floor, in addition to the wide living-room, a large kitchen, 1 bedroom, a shower-room and guest toilets. On the 1st floor, 4 bedrooms -including one with a loggia- and 3 bathrooms. On the top floor, 1 bedroom with a terrace and a shower-room. On the canal side, a terrace and a garden with a private swimming-pool. Exceptional mooring: 18,60m x 7,40m. A large house with much charm!